Loblaws Flyer Dollar Days Deals 16 Nov 2018 available to check here online. Multiple discounts and special offers waiting only for you. These special offers contain great foods for cheaper. If you are a chef of your kitchen, these special deals very good for you. Black Friday deals also great! It is the perfect time to stock your food before events are finished. Also, you can find Black Friday gift ideas in Loblaws Flyer. Check out for more, enjoy for more than everything! Look for more great Dollar Days saving on page six and seven! 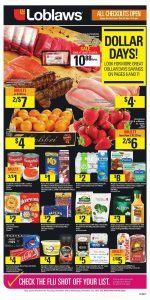 Loblaws Flyer Dollar Days Deals 16 Nov 2018 contains Black Friday deals in every page. Also, you can visit a Loblaws store for more Black Friday discounts. I hope you will find your needs for amazing price in Loblaws Flyer. Not only food but also gift ideas are on your service. Black Friday gift ideas and more, available in this Loblaws flyer. Enjoy your shopping!